Detailed computer simulations are a powerful tool to study one of the biggest challenges for theoretical cosmology: How did the galaxies we see in the universe today form out of the small fluctuations in matter density that were present in the primordial universe? Having carried out the largest cosmological simulation ever, scientists at the Max-Planck-Institute for Astrophysics are able to follow the hierarchical galaxy formation process with unprecedented accuracy and detail, allowing new theoretical insights into dark matter dynamics, and novel tests of the cold dark matter theory for galaxy formation. Fig. 1: Large-scale structure in the dark matter, as seen in a slice through a small part of the simulated universe. 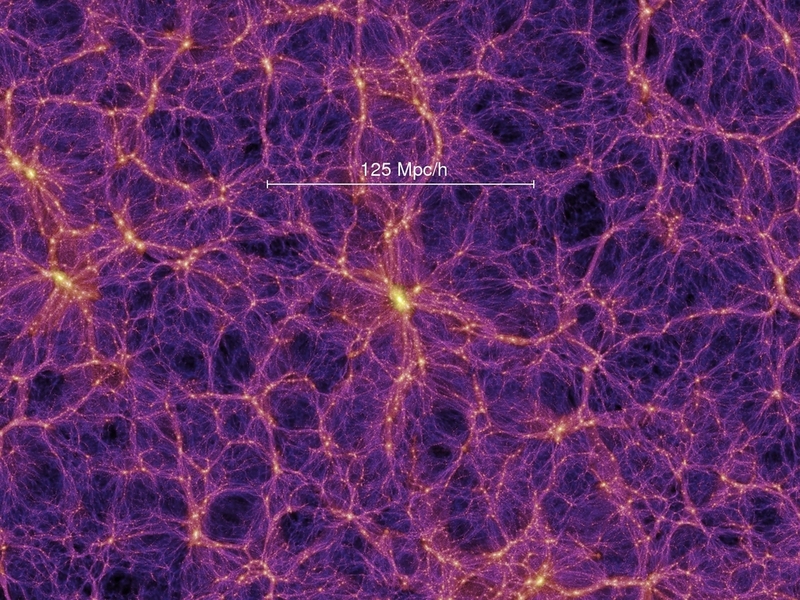 Clearly visible in the top panel is the `Cosmic Web' which connects individual galaxies, groups and clusters by filaments of dark matter, surrounding large underdense voids. The bottom panel enlarges a region around a rich cluster of galaxies. (click on picture to magnify). Fig. 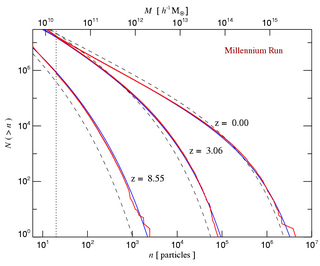 2: The number of dark matter halos above a given mass threshold, shown at three different times. The blue line is an analytic fitting function by Sheth & Tormen, which describes the simulation results very accurately, much better than the older Press & Schechter theory (dashed). The vertical dotted line marks the halo resolution limit of the simulation. Fig. 3: The rate of time variation of the gravitational potential in a slice through the simulation box. As photons pass through the time-varying potential, fluctuations in the cosmic microwave background radiation are induced (Rees-Sciama effect). Recent progress in observational cosmology has established a standard model for the material content of the Universe, and its initial conditions for structure formation 300000 years after the Big Bang. Most of the mass in the Universe (~85%) consists of dark matter, an as of yet unidentified weakly interacting elementary particle. Initial fluctuations in this mass component, seeded by an early inflationary epoch, are amplified by gravity as the universe expands, and eventually collapse to form the galaxies we see today. To model this highly non-linear and intrinsically three-dimensional process, the matter fluid can be represented by a collisionless N-body system that evolves under self-gravity. However, it is crucial to make the number of particles used in the simulation as large as possible in order to model the universe faithfully. Scientists at the Max-Planck-Institute for Astrophysics, together with collaborators in the international Virgo consortium, were able to carry out a new simulation of this kind using an unprecedentedly large particle number of more than 10 billion. 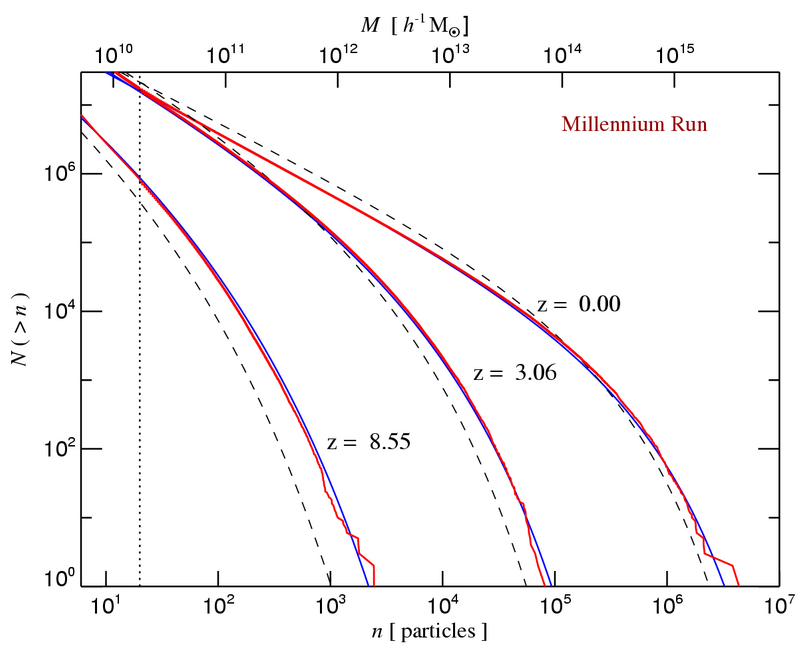 This is about an order of magnitude larger than the largest computations carried out in the field thus far and significantly exceeds the long-term growth rate of cosmological simulations, a fact that inspired the name "Millennium Simulation" for the project. This progress has been made possible by important algorithmic improvements in the employed simulation code, and the high degree of parallelization reached with it, allowing the computation to be done efficiently on a 512 processor partition of the IBM p690 supercomputer of the Computing Center of the Max-Planck Society (RZG). Still, the computational challenge of the project proved to be formidable. Nearly all of the aggregated physical memory of 1 TB available on the massively parallel computer had to be used, and the analysis of the ~20 TB of data produced by the simulation required innovative processing methods as well. The simulation volume is a periodic box of 500 Mpc/h on a side, giving the particles a mass of 8.6 x 108/h solar masses, enough to represent dwarf galaxies by about a hundred particles, galaxies like the Milky Way by about a thousand, and the richest clusters of galaxies with several million. 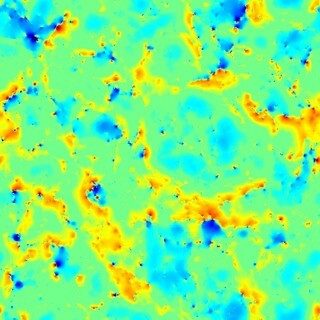 The top panel of Figure 1 gives a visual impression of the dark matter structure on large scales at the present time. 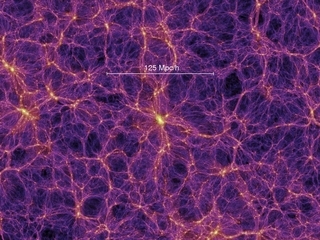 The Millennium simulation shows a rich population of halos of all sizes, which are linked with each other by dark matter filaments, forming a structure which has become known as "Cosmic Web". The spatial resolution of the simulation is 5 kpc/h, available everywhere in the simulated volume. 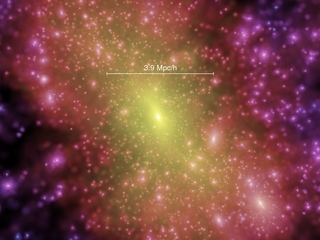 The resulting large dynamic range of 105 per dimension in 3D allows extremely accurate statistical characterizations of the dark matter structure of the universe, including the resolution of dark matter substructures within individual halos, as seen in the lower panel of Figure 1, where we zoom in on one of the hundreds of rich galaxy clusters formed in the simulation. In Figure 2, we show the non-linear halo mass function of the simulation at different times, serving as an example for the exquisite accuracy with which key cosmological quantities can be measured from the simulation. An important feature of the new simulation is that it gives an essentially complete inventory of all luminous galaxies above about a tenth of the characteristic galaxy luminosity. This aspect is particularly important for constructing a new generation of theoretical mock galaxy catalogues, which for the first time allow a direct comparison with observational data sets on an "equal footing", because the Millennium simulation has a good enough mass resolution to yield a representative sample of galaxies despite covering a volume comparable to the large observational redshift surveys that have become available recently. The galaxy data obtained for the Millennium simulation will be stored in a "theoretical virtual observatory", allowing queries similar to those applied to large observational databases. The large volume of the Millennium Simulation is also crucial for studying rare objects of low space density, such as rich clusters of galaxies, or the first luminous quasars at high redshift. At the same time, the high dynamic range of the simulation allows accurate theoretical predictions for effects of strong and weak gravitational lensing, and it allows the study of fluctuations induced in the cosmic microwave background by the time-varying gravitational potential, as illustrated in the Figure 3. As cosmology enters a "precision era", large computer simulations like the Millennium run become ever more important to account for the full complexity of cosmic structures, and to provide sensitive tests of our current theoretical understanding.